Fremont, CA, August 23rd, 2018: eSalesData is celebrating ten years of its excellence this year. Adding onto the celebration is the upcoming 136th Labor Day in the United States. 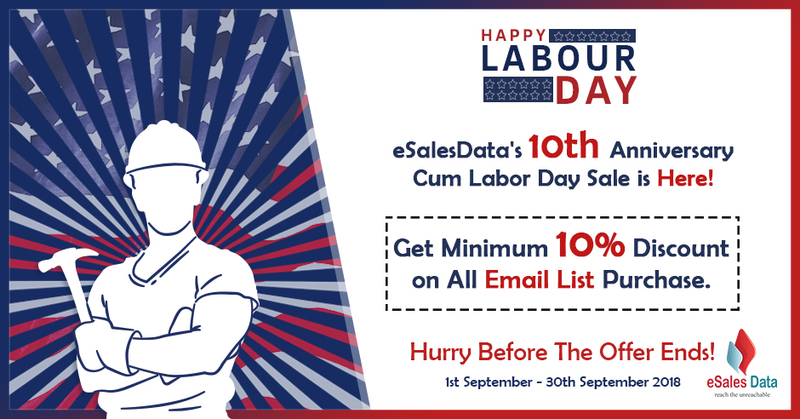 To celebrate the joint occasion with pomp and honor, eSalesData is all geared up with exciting offers that will start from 1st September and continue till 30th September. The month-long offer includes a minimum 10% discount on the purchase of every quality list. “Like every year, this year too we thought of making the celebration even more special for our customers. As everyone is gearing up for 3rd September, we at eSalesData have been working on tailoring deals that best suit marketers. Moreover, we are celebrating our 10th anniversary as a reliable data provider in the market. So, what could have been better than giving a kick-start to the holiday season with a bang on deals?” says Tony Huff. eSalesData is a leading marketing database provider. We offer a wide range of business data lists covering various industries, specialties, job titles and much more. With a decade of experience, as a company, we have been successfully helping businesses connect with their prospects using our quality email and mailing lists. Apart from the supply of accurate B2B records, we also offer effective solutions such as data appending and cleansing services, data profiling, licensing, reselling services, online marketing assistance, and more. We have also recently come up with GDPR services to help businesses get the proper guidance on how to embrace the compliance rules of the new regulation.